Honda has not forgotten the entry-level cruiser segment, as these bikes are in fact far more important than most of us think they are. Since many of the new riders are not allowed to ride a middleweight cruiser, here`s the 2014 Honda Rebel helping them take the first step in the two-wheeled world. We`re looking at quarter-litre-class parallel twin machine which can serve as a very nifty beginner bike and a replacement for the big-bore machines for daily urban rides. The 2014 Honda Rebel is way more preferable to a bulky and petrol-hungry 1.5-liter cruiser in the middle of the slow traffic and that`s why these machines are still successful after all these years. 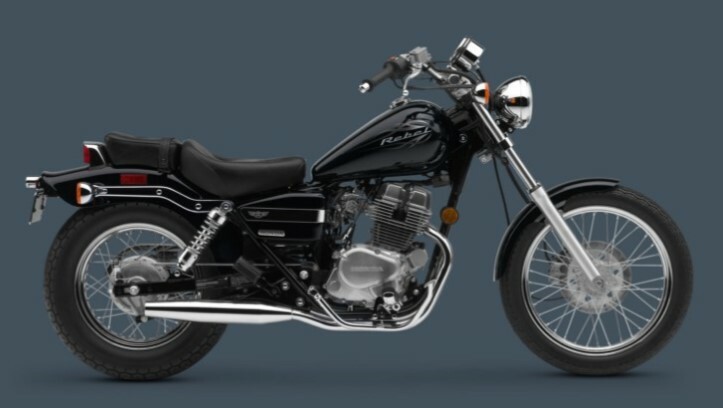 The bike comes with a convenient 5-speed manual gearbox and chain transmission, 33mm forks and dual rear shocks with 5-way preload adjustment, single disc front brake and a drum for the rear. With its seat 26.6 inch (67.5 cm) above the ground, the 2014 Honda Rebel makes a great ride for shorter motorcyclists and provides even ladies with a firm ground contact once stopped. The 331 lb (150 kg) weight is just fine for pretty much anyone, light and still offering a massive, reassuring feeling.